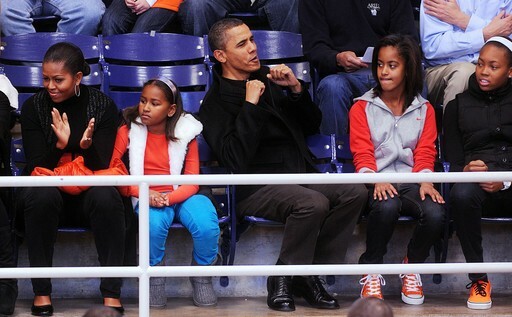 Last Saturday night, the Obama family attended a basketball game in Washington, D.C. The entire family, including Michelle’s mother, Marian Robinson, watched Howard University take on Oregon State, coached by Craig Robinson, Michelle Obama’s brother. The Obama family kept their wardrobe palette in line with the colors of the Oregon State Beavers, wearing all orange and black. Mrs. Obama was dressed in solid black. She wore black, slim-fitting trousers and a black turtleneck paired with a knee-length, textured vest. She then added a punch of color by strapping a bright orange belt across her waist. 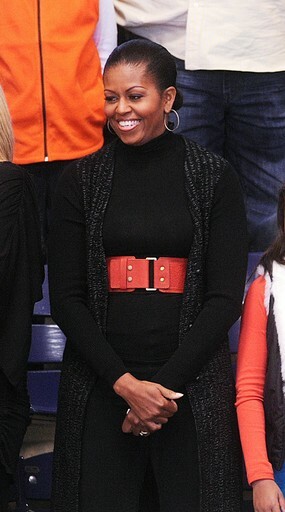 Surprisingly, the first lady did not choose her signature style of placing the belt atop her vest. Instead, she layered the textured vest over the orange belt. Did this surprise anyone else? 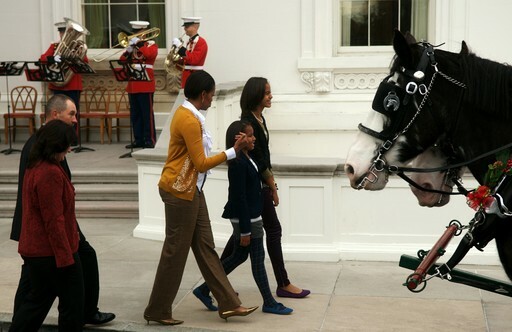 Additionally, I must note Malia’s orange sneakers, how cute! Yesterday afternoon, in celebration of Thanksgiving, the entire Obama family gave back to the community. President and First Lady Obama, along with daughters, Sasha and Malia, The family served turkey and stuffing to underprivileged children, youth and families at Martha’s Table, a food pantry located in downtown Washington, D.C. This is the same organization the Obama family volunteered for last Thanksgiving as well (see last year’s Thanksgiving outfit here). For this occasion of serving the community, Michelle opted to wear an ivory knit vest layered atop another long sleeve, ivory knit sweater. This is a rather interesting choice of apparel. If she wanted to layer, you would think she would have chosen two separate colors, right? However, the monochromatic look is indeed in this season (see here). Perhaps, the first lady was trying to be on the cutting edge of fashion, as she so often is. She paired these sweaters with a silk, lavender colored Prova scarf (similar to a scarf she was seen wearing over her head in an Indonesian mosque here). The scarf was highlighted layered fringes of gunmetal beads and white pom poms. Malia also chose one of this season’s trendy looks by layering a polka dot cardigan over a button down blouse, Love this look! If the mother and daughter were to battle it out in the fashion ring, who do you think would win? Malia has my vote! What do you think about this layering of look? I love Malia’s ensemble, but is Michelle’s look a fashion hit or miss?